The National Clinical Mental Health Counselor Examination (commonly known as the NCMHCE exam) was developed by the National Board for Certified Counselors. All of the questions on the exam have been written, edited, and field-tested by experts in mental health counseling. *Please Note: Each state counselor licensure board administers the application process and procedures in accordance with the state law. This includes determining requirements to sit for the examination. 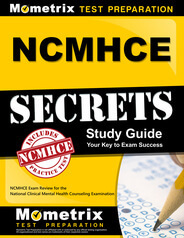 Prepare with our NCMHCE Study Guide and Practice Questions. Print or eBook. Guaranteed to raise your score. Get started today! Candidates register for the exam through their individual state licensing boards. An exception is made for those licensed counselors applying for US military employment or TRICARE mental health counselor certification. Military candidates complete a special registration form and send it NBCC. Nonrefundable and nontransferable fee payable by check, money order or credit card. Please check with your testing state for specific fee amount. NCMHCE Flashcards. 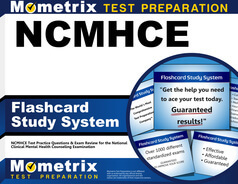 Proven NCMHCE test flashcards raise your score on the NCMHCE test. Guaranteed. For certification purposes, the NCMHCE is administered twice a year (April and October). The NBCC administers the examination by appointment only on authorized dates, Monday through Friday, 9 a.m. and 1:30 p.m. If you are unable to make your test date, rescheduling is allowed 24 hours before your scheduled testing session through Pearson VUE. A $50 rescheduling fee applies. If you choose not to reschedule within 24 hours, you forfeit all exam fees. Pass/Fail score determination. Applicants must have a total passing raw score in both the IG and DM sections to be considered as passing the NCMHCE. The raw score is based on 9 scored simulations on your test. There is one unscored simulation included on the exam to be used for future testing. You will receive an unofficial score immediately after the exam (Please Note: if you do not pass, retaking the exam is permitted; however, you will have to wait at least 3 months from your initial test date. A re-registration fee applies). Information Gathering (IG) will determine your knowledge and ability in gathering appropriate clinical data required in evaluating situations or sound decision making. Appropriate clinical data may include family background or status of physical health. Be sure to select all appropriate options. Selecting more or fewer correct options may adversely affect your score in this area. It is important to remember that this is not a typical multiple-choice test. Decision Making (DM) will test how well you solve clinical problems using data to make sound judgments and decisions. Like the IG section, there may be a single best (meaning there may be more than one acceptable option, but one option will be considered most acceptable) or multiple options as correct answers (meaning severaloptions are deemed appropriate). Assessment and Diagnoses – integrating client assessment and observational data; identifying precipitating problems or symptoms; identifying individual and/or relationship functioning; identifying relevant family issues. Counseling and Psychotherapy – informing client about ethical standards and practice; clarifying counselor/client roles; implementing individual counseling pertaining to plan of treatment; evaluating referral information. Administration, Consultation and Supervision – maintaining case notes, records and/or files; determining if services meet clients’ needs; communicating orally with others to maintain professional communications; assisting clients with obtaining services. Each simulation will measure your ability to narrow down a diagnosis. How well do you understand the client’s feelings? Can you identify the cause and effects of said feelings? It is important to be able to differentiate and assess what best meets the client’s needs. This requires integrating how you observe the client versus the client’s own assessment of their condition. For instance, can you separate bipolar I from bipolar II. Becoming an expert in differentiating between disorders, further clarifying your role in creating a treatment plan, and measuring the effects of services on a client’s needs will be a key indicator of whether or not you are ready to take this exam. It is recommended that you obtain study materials to assist in preparing for this test. As a guideline, make it a point to study old material while learning and gathering new information. Do not postpone studying. Memorizing words and concepts or cramming information in a short period of time will not help you. Because this exam is unlike most standardized, multiple choice tests, preparation for the NCMHCE should include putting together information and studying 3 to 4 months before your scheduled test date. Taking practice tests will help you. Make it a point to speak to licensed colleagues who have taken the test.